FPT electric powertrain solutions. Electrified technologies are becoming fundamental for the powertrain industry in its journey to provide zero-emission offerings. With innovation at its core, FPT Industrial is developing electric powertrain solutions. In addition to its industry expertise, FPT Industrial can also count on the electrification heritage of CNH Industrial. Together with its sister brands, FPT Industrial has participated in electrification projects since the ‘80s. More recently, the Brand announced its e-Powertrain team, a division inside the Powertrain Product Engineering department entirely dedicated to the development of electric powertrain solutions. electric propulsion and electric assist. FPT Industrial presented two solutions that consider electric power playing a direct role in vehicle propulsion – the E-Axle and the Transfer Box. The E-Axle is a compact and flexible solution that transfers power and torque to the wheels through the gear unit, resulting in a modular concept which can be easily adapted to various vehicle layouts and weight capabilities. It can deliver power of up to 250 kW and 98% efficiency in the main working conditions. The main benefit of the E-Axle is that is easily adaptable to different customers’ needs. It can support three vehicle layouts – front, rear and all-wheel drive – with different suspension systems – independent or rigid – simply by changing external shape, without impacting the core components. The solution can also be used in different vehicle categories. Alongside urban mission light and medium commercial vehicles, it could also be developed for compact vehicles for agriculture and construction equipment. Finally, thanks to the compact design, the E-Axle can even be installed in vehicles with very tight layouts. The Transfer Box is a different solution that adds an electric power unit to the original engine, enabling the management of all propulsion modes – electric, hybrid and thermic. It is installable on existing vehicles, scalable for different vehicle modes, with a very low impact on them. It delivers 98% efficiency and a torque at wheel of 8,000 Nm. The Transfer Box is the ideal solution for vehicles with different missions and functional requirements, such as intercity missions with the need for an electric ‘last mile’; for long-haul full hybrid applications; and for mixed usage construction equipment, in urban and extra-urban building sites. While the E-Axle could be applicable for OEMs that are looking for a sustainable compact solution with great performance, the Transfer Box has the application scalability, range of power and energy density and durability as its main benefits. The second group of FPT Industrial’s electric strategy focuses on the support of the thermal combustion engine in all its operational modes, with the option of a mild hybrid powertrain architecture. 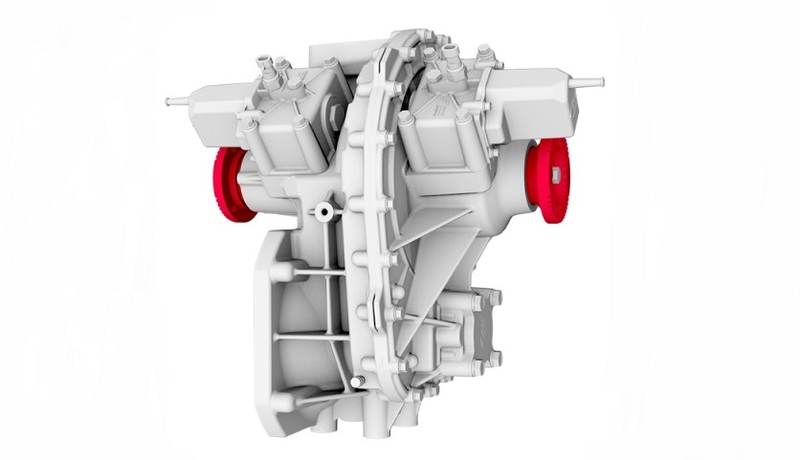 The thermal engine has two main extra components, the E-Flywheel and the E-Turbocharger, which recover energy that can be reused. Compared to a conventional Diesel engine, these components guarantee sustainability, performance, efficiency and fuel saving. In fact, FPT Industrial’s mild hybrid solution can reduce fuel consumption by up to 8%, improve transient response by up to 50%, increase low speed torque, optimize the engine strategy and provide energy availability for auxiliaries and implements. Industrial powertrain solutions need to respond to different market requirements, therefore, FPT Industrial believes that system integration capabilities and a modular technical solution are essential to ensure a competitive offering. Thanks to its features, the mild hybrid powertrain can be applied to a wide range of applications – from low to high energy demand vehicles, with small to large dimensions, On-Road, Off-Road and Marine segments. FPT Industrial is a brand of CNH Industrial, dedicated to the design, production and sale of powertrains for on and off-road vehicles, marine and power generation applications. The company employs more than 8,000 people worldwide, in ten manufacturing plants and seven R&D Centres. The FPT Industrial sales network consists of 73 dealers and about 800 service centres in almost 100 countries. A wide product offering, including six engine ranges from 42 hp up to 1,006 hp, transmissions with maximum torque of 200 Nm up to 500 Nm, front and rear axles from 2 to 32 ton GAW (Gross Axle Weight). FPT Industrial offers the most complete Natural Gas engines line-up on the market for industrial applications, including engine ranges from 136 hp up to 460 hp. This extensive offer and a close focus on R&D activities make FPT Industrial a world leader in industrial powertrains.